On 16th April, the Artwiculate Word of the Day was wizen. This is a word of Old English origins, so it seemed appropriate to offer some fragments of cod Anglo-Saxon alliterative verse. Warp and weft, wending, winding. Wasted women and wizen weans. 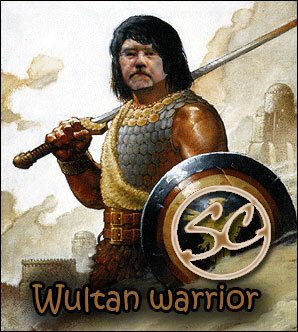 War for what, wondered Wultan. Yet willing to welcome wise words. Were the Witan, stricken weird. The above illustration is a perversion of a painting, by Mark Schultz, of Conan the Barbarian, borrowed from Wikipedia. I enjoyed this post. Thanks for putting it up. Thanks Mundahl. Glad you liked Wultan – a lot of fun to write. That’s a very Swedish-looking name. Are you?